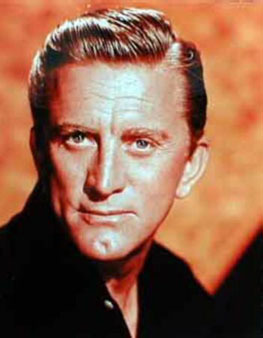 Kirk Douglas worked his way through St. Lawrence University as a waiter, where he studied drama and wrestled on the school team. He merged these crafts by briefly becoming a professional wrestler, and palled around with big-time wrestling's immortal but now departed Lou Thesz for years. He joined the Navy in World War II, and his first big break after the war was playing a dead soldier on Broadway in The Wind is 90, with 17-year-old Dickie Van Patten. The reviews were good, and he started getting offers from Hollywood. In his first film, he was Barbara Stanwyck's wimpy husband in The Strange Love of Martha Ivers (1946). He quickly molded a screen persona as a tough, cocky, guy -- a dim gangster in Out of the Past (1947), a jazzman in Young Man with a Horn (1950). Douglas later starred in the super-cynical Paths of Glory (1957) and The Big Carnival (also known as Ace in the Hole, 1951). In the former he's a military man, hung out to die by his superiors. In the latter he's a washed-up reporter looking for a big story. Douglas was one of the first big name actors to establish his own production company. The Bryna Company, named after his mother, produced Paths of Glory, Lonely Are the Brave (1962), and Seven Days in May (1964). Douglas starred as Spartacus in that slave-revolt epic (1960), and Bryna produced it, which leveraged his Hollywood power into an unwavering demand: Dalton Trumbo, who had decades of screenwriting experience but had been blacklisted for his political views and jailed for refusing to "name names" -- would write the screenplay, and not behind a front. It was a pivotal moment in crumbling the Hollywood blacklist. Douglas starred in One Flew Over the Cuckoo's Nest on Broadway, and bought the movie rights in 1963. But it took more than a decade to get the film financed, and by then he felt he was too old to play the lead. His son Michael Douglas produced the film, and it starred Jack Nicholson. He survived a helicopter crash in 1991 in which two people were killed. He flirted with killing himself after being hobbled by a stroke in 1996, but decided "suicide is stupid and selfish". Instead he wrote another book, My Stroke of Luck. Golda Shira and Pauline Dubkin Yearwood, "Kirk Douglas returns to Judaism", Chicago Jewish News, reprinted in Jewish News of Greater Phoenix, 30 May 2003: "Kirk Douglas wanted to talk about the movie and he wanted to talk about Judaism. It's well known from the first volume of his autobiography, The Ragman's Son, that he experienced a resurgence of interest in his religion after a helicopter crash and, later, a stroke that left him partially disabled. He even had a second bar mitzvah at the age of 83, and he continues to recommit himself to the richness of the very heritage from which he had been so estranged for so very long." Hollywood Walk of Fame 6263 Hollywood Blvd. There Was a Crooked Man... (19-Sep-1970) · Paris Pitman, Jr.